One of my true favorites for the early summer season is coming soon to our Mississippi landscapes. Starting mid-May through June, this plant will have some of the few, almost true-blue flowers in the plant world. So what is this plant? 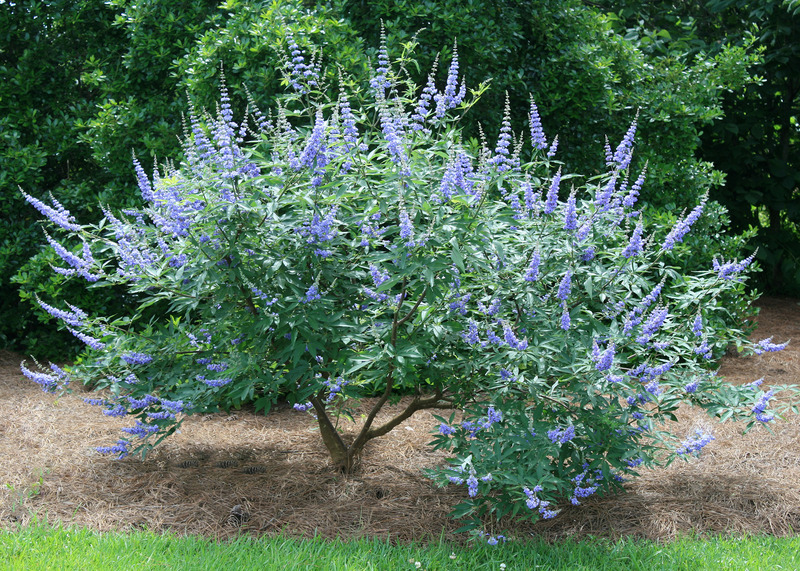 The common name is chaste tree or vitex, and it was named a Mississippi Medallion winner in 2002. 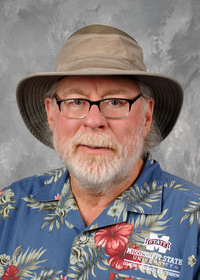 The bloom period begins around Memorial Day on the Gulf Coast and soon afterwards in north Mississippi. The main flowering period lasts up to six weeks. The flowers are composed of many clusters of small, individual flowers grouped together on a long inflorescence, or flower cluster. In some varieties, this inflorescence can be up to 18 inches long. The color varies from lavender to lilac and pale violet. It can even be a brilliant, nearly fluorescent blue. During the initial flush, the show of flowers may resemble a hazy blue or purplish cloud. On days when there is just the gentlest breeze, you can enjoy the blooms’ delicate, slightly floral scent. We have a couple of different vitex plantings at the Mississippi State University Coastal Research and Extension Center in Biloxi. One is out by the main road, and passersby often stop or call to ask about the plants. The other is right outside my office window. 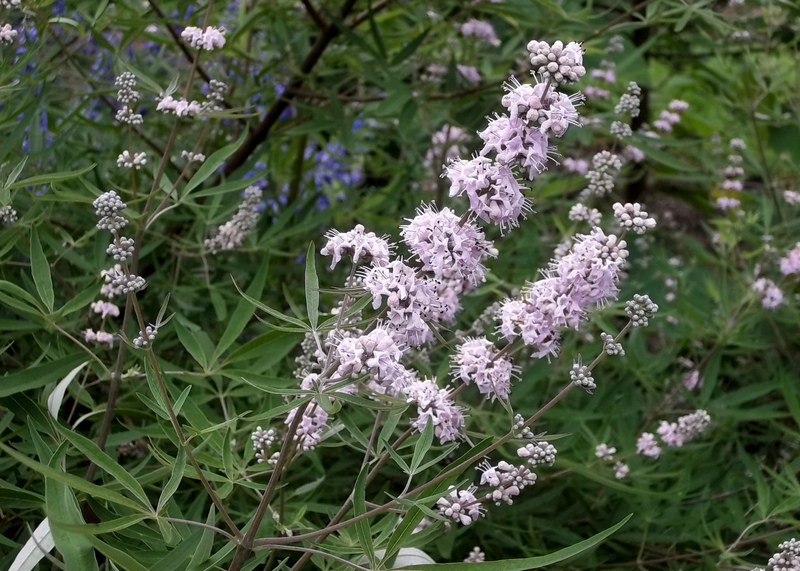 The straight species Vitex is a great summer plant for us, but be on the lookout for the improved Shoal Creek selection. The vigorous spring/summer flush of flower spikes are some of the largest, and they are a more intense and deeper blue than the regular species. 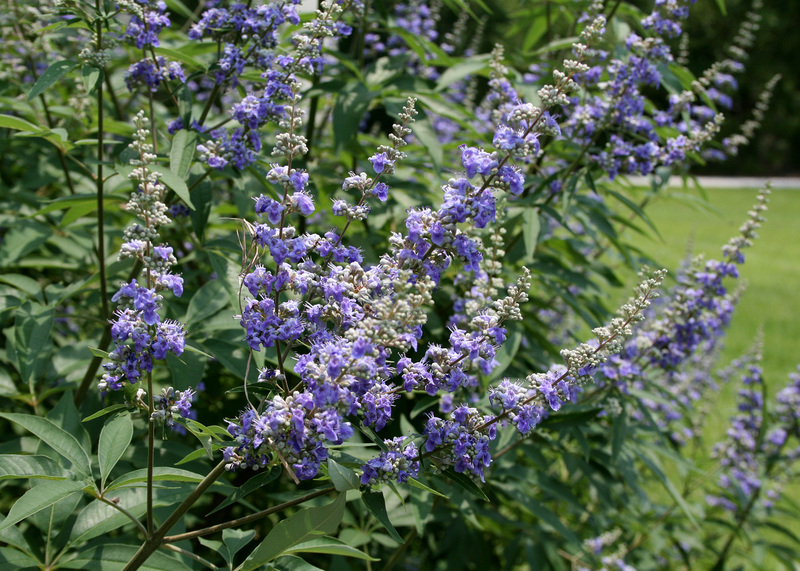 In 2011, Shoal Creek vitex was named a Louisiana Super Plant. The adventurous and persistent gardener can find pink and white varieties. The sweet, aromatic foliage is arranged on square stems in clusters of palmate leaves. The foliage is dark gray-green on top and bluish gray underneath. When mature, the leaves have slightly fuzzy bottoms. Vitex thrives in our hot and humid weather extremely well, which makes this an outstanding small tree for our Mississippi landscapes. It is also a good plant for the periods of drought we have each summer. While vitex can be grown as a single-trunked tree, I think it is more attractive in the landscape when grown as a multitrunk specimen. Vitex tolerates a wide range of pruning styles and can be easily maintained as an 8- to 10-foot tree. Pruning actually promotes compact branching, resulting in a thicker, bushier plant. Since vitex flowers on new wood, which is the current season’s growth, pruning actually encourages and enhances flowering. I prefer to keep chaste tree as a small- to medium-sized shrub, and I suggest you prune it as you would your butterfly bush. Prune back to 12 to 18 inches in the early spring just as new growth is starting. Plant vitex in partial shade to full sun for best flowering performance. These plants tolerate a wide variety of soil conditions and textures, but make sure the planting bed has well-drained soil.